It’s true! 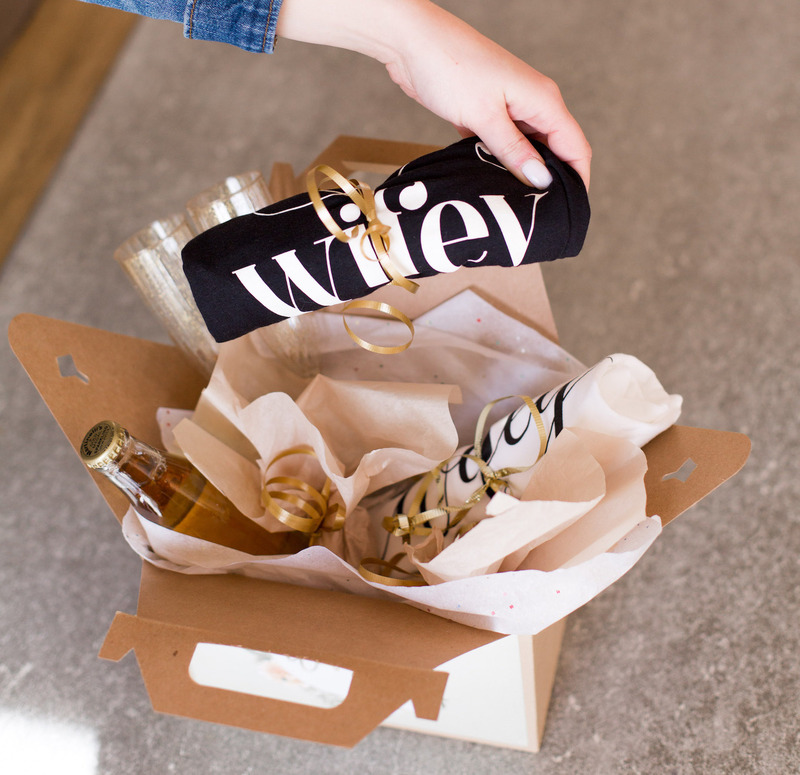 We do hereby declare, with as much authority we can muster as a national wedding magazine, that Perfect Wedding Guide’s Wed Box is the cutest wedding subscription box in the world. And yes, the adorability scale is wildly subjective and dependent on each engaged couple’s personal taste, but that’s alright. Even if you, personally, don’t think the Wed Box is adorable, we can all at least agree that it’s an efficient money-saver, a helpful wedding planning tool, and perfectly tailored to our local, Albuquerque + Santa Fe engaged couples. But enough of the fluff — let’s get down to the ins and outs of the Wed Box. (Specifically the ins.) Nestled inside the craft box is a curated collection of coupons, gift cards, giveaways, and gifts all exclusively from local wedding professionals here in New Mexico. Sweet treats, cute and comfy tees, and substantial discounts on wedding services have been known to grace the box in years past, but everything, every year is brand-spanking new. Unlike other subscription boxes, too, the Wed Box only comes around once a year, when the Spring/Summer edition of our print magazine is set to hit the streets. With a look at upcoming 2019/2020 shows, new and veteran vendors, and local inspiration, you’ll be one of the very first lucky-loos to grab ticket codes and other perks hidden within its pages. We’re very proud to be deeply ingrained into our local community, too. In fact, it’s our favorite part of being Perfect Wedding Guide! So, when the day comes for your Wed Box to arrive, it won’t come from FedEx. It will be hand delivered, after being hand packaged with products chosen by hand, right to your door by one of the lovely ladies who make up our woman-led, women-run team. Ready to grab yours? Click here to be one of the 25 engaged couples to receive a Perfect Wedding Guide Wed Box. Okay, so maybe we’re a bit nostalgic, but is that so wrong? 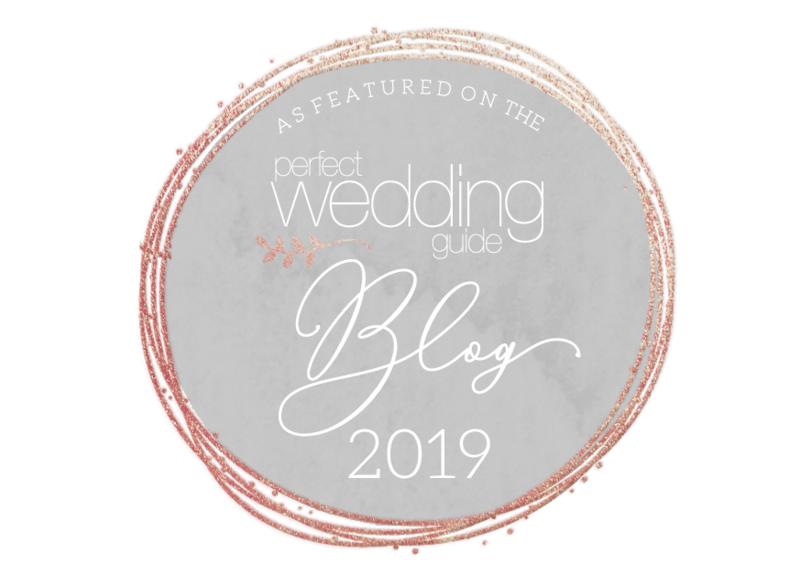 Especially since we’re only a few days into 2019, and here in New Mexico, 2018 was one of Perfect Wedding Guide‘s best years yet. We had wedding shows, luncheons, and parties galore, plus relationship building, contest-throwing, giant giveaways, and more. The only way to rectify our desperate reminiscing is to start look eagerly toward our upcoming events, which we’re definitely doing, don’t get us wrong. But before we jump ahead, we have to spend at least a moment discussing the experience of our Four Seasons Connection Luncheon that was in December of 2018. Because that’s exactly what it was — an experience. Four Season‘s unparalleled elegance, the crisp, clean air of Santa Fe, and Alena Bard LLC.‘s wisdom all combined to create a truly moving afternoon. Lucky for us, Keara Lloyd Photography was there to capture every moment, too, from the first course to the last lingering conversation. The former being, if you can believe it, warm quail on a bed of roasted fennel salad, decorated with a complimentary beet puree, roasted almonds, and white balsamic glazed blueberries. Then came the duel entrees: slow braised short ribs with green chile mashed potato, and chorizo and macadamia roasted Chilean sea bass. Accompanying every bite was a light and refreshing sparkling wine that prepared the palette for our team’s personal favorite, the dessert: strawberry trifle with sponge cake, vanilla and Chantilly cream. The only thing that rivaled the dessert’s sweetness was the absolute treat of hearing local wedding planner Alena Bard LLC. share her knowledge to the group of local business owners. She talked finding your purpose, holding onto it, and weaving passion and self-compassion into your business practices. We walked away feeling filled to the brim with inspiration and delectable cuisine. The best part of being positioned between local engaged couples and the businesses who serve them is being able to spoil both parties. For our engaged couples, it’s through our giveaways, wedding shows, online tools, print guide, etc., etc., etc. And for the local wedding professionals, who work so hard to elevate and evolve Albuquerque + Santa Fe’s market, it’s through indulgent, invigorating, innovative days like this. Did you hear about the absolutely magical, high-energy, fun-filled, spectacular something that happened this past October? We hope you did, or even better, we hope you were one of the hundreds of local, engaged couples and wedding professionals who joined us for our 2018 Diamond Dash Wedding Show! Every year, we have the opportunity to host what is essentially a giant party, here in Albuquerque, for all our local engaged couples who are in the throes of wedding planning. And yes, we host lots of parties and wedding shows, but this one is the Diamond Dash, which makes it inherently special. See, if you don’t already know, this particular wedding show gets its name from the culminating moment of the show. 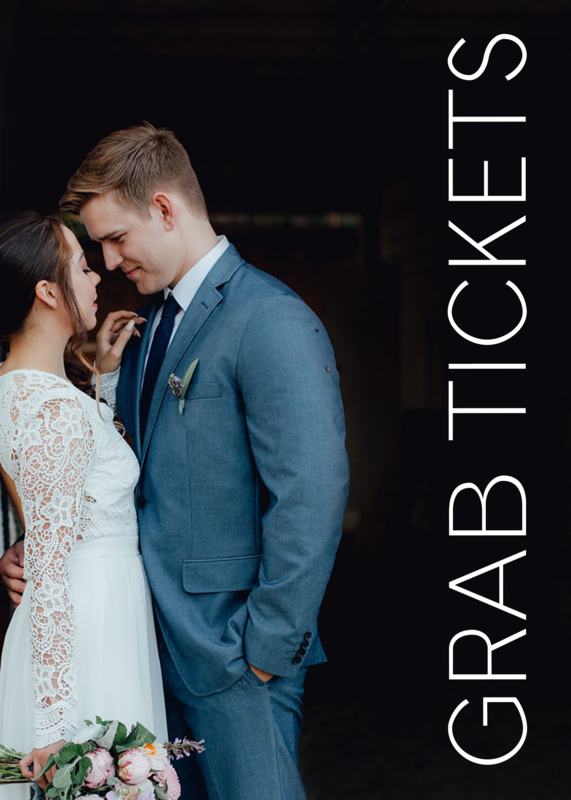 After engaged couples spend the day in the Hyatt Regency Downtown‘s vast and beautifully curated ballroom, chatting with local wedding professionals, winning prizes and coupons off services, watching a couture bridal fashion show, and spending their $500 in PWG Bucks, then comes the actual dash for diamonds. This year, we invited 5 brides-to-be from the crowd of hundreds to come and don the signature aprons and tiaras required to jump into the baked goodness. Kindly made by Cake Fetish, the glamorously towering black wedding cake had, of course, diamond jewelry (valued at over $1,000) along with four other prizes hidden inside. With their cake-diving gear on and ready to go, and the rest of the crowd anxiously awaiting the victory, the five awesome ladies tore into the beautiful cake and one by one, pulled out their prizes. We love the competitive spirit that comes out when diamond jewelry is involved, so when this year’s festivities resulted in some harmless catfighting, we were thrilled. Check out all the incredible details from every vendor through the lens of Photographic Perspectives below, and take a peek at the live action with the incredible recap video from Glory Ranch Films! To register for the next Diamond Dash Wedding Show, click here! Since our last wedding show of the year has, tragically, already come and gone, we think it’s only fair to spend a little bit of time reminiscing on one of our favorite shows of 2018. While all of our Albuquerque + Santa Fe wedding shows are things we celebrate and enjoy, my personal favorite of the year was the Wedding Gallery show at Sandia Resort and Casino. On the sunny morning of August 5th this past year, our Perfect Wedding Guide team arrived bright and early at Sandia Resort to watch the magic unfold in one of their most grand ballrooms. And let us tell you, folks, it really did. We got to watch — and lend a helping hand, of course — as dozens of vendors filled the room, bringing their best decor, goodies, flyers, and free stuff to one space for you, our local couples. The theme of this year’s Wedding Gallery show was jeweled elegance, and my gosh, was it rich. Bright golds and silvers complimented the deep maroons and greens, blues and mustards throughout the ballroom. Every vendor carefully coordinated their corner of the space to showcase and showoff all the enchanting things they can make possible, and it came together in the most cohesive, jewel-toned wonderland you can imagine. After the mingling and connecting of local vendors to the hundreds of engaged couples who graced us with their presence, then came the fashion show. With styles from Suits Unlimited for the fellas, and Bridal Elegance by Darlene for the ladies, every couple got a New York worthy dose of in-real-life wedding fashion inspiration, that was also tied in with our overall theme for the event. Velvet, vintage couches headed the runway, and Brad with King Mobile Music lit the stage to perfectly illuminate the fine details on the gowns and tuxes. Lastly, there were, of course, tons and tons of giveaways and prizes. With free goodies from venues, florists, officiants, and more, so many couples walked a way with a spring in their step after winning some serious discounts and freebies. We couldn’t have done it without our incredible sponsors, or the amazing couples whose love stories are what make the whole day worthwhile. So, from the bottoms of our hearts, thank you! With November nearly behind us, and the holiday season coming on the horizon, there’s not much we want to do except lay in our cozy, warm beds and scroll through the wedding section of Pinterest, if we’re being honest. Though the holiday season is known in the wedding world as engagement season, so there’s still much to be done. In times like these, we look to our local wedding professionals for a little boost and a little inspiration. Jewelry by Josana, a local, custom jewelry business, is exactly what the doctor ordered. Josana’s work, riddled with sparkles and captivating to see in the light, is what we need to bring a little bit of warmth and sunshine back into these chilly almost-winter days. As a wonderfully spiritual and intuitive person, Josana endows each of her custom jewelry pieces with intention, love, and blessings for their wearers. Jewelry by Josana started several years ago when Josana herself began to recognize the importance of jewelry for herself. Now, after 50 happy years of marriage to her hubby, Josana makes jewelry for engaged couples to wear on their wedding day and beyond, so they too, can have this physical connection to something beautiful. It is exhilarating for me to see their smiles and excitement when they receive their jewelry! There is nothing like beautiful jewelry to heighten a person’s self esteem. Using only the finest quality of metals, gemstones, and beads in their work, Jewelry by Josana helps couples choose their pieces to emphasize their wedding colors and add personal touches to reflect their love story within the jewelry. From hypoallergenic metals and crystals, to freshwater coated pearl, cultured pearls, Preciosa, Australian Crystal, Crackled Crystal, and so much more, the shape, size, and color combinations are nearly limitless for your jewelry. If you’ve been planning your wedding, or are just obsessed with weddings like we are, then by this point, you probably cringe when you hear about something to make your wedding unique. But truly, each celebration of love is as individual and unrepeatable as your relationship with your soon-to-be-spouse, and highlighting that is one of the most fun parts about your wedding — besides the actual marrying your sole mate part, of course. Having custom-made, handcrafted jewelry for you and your wedding party is simply one of the easiest, and most affordable ways to do just that. Oh, and did we mention? Your jewelry package order comes with a flower girl set at no extra charge, just to sweeten the day even more. Leave your bridesmaids and partner with tangible memories of the beginning of your life together to cherish for the rest of your forever. To contact Jewelry by Josana for your custom jewelry today, you can contact her here.